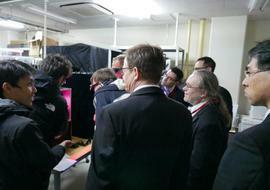 Between December 17 (Mon) and December 19 (Wed), TUT was visited by six members of the University of Eastern Finland's School of Computing, including the Department Head Markku Hauta-Kasari. TUT has entered into a double degree program agreement with the University of Eastern Finland, and plans to begin the program from the 2019 academic year. Under the program, students simultaneously enroll in both a doctorate program at TUT and a master's program at the University of Eastern Finland, and of these students, those who received at least one year of education from each institution and satisfy the completion requirements, shall be awarded a degree from both universities. During this visit, in order to further deepen their understanding of our educational research, the members from UEF were able to observe our university practices, and share in an exchange of opinions with TUT staff for the purpose of realizing the program. 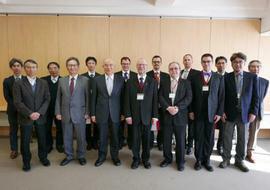 On the 17th (Mon), an information exchange event was held relating to both institutions and their researchers. The following day 18th (Tue), the UEF members took part in an observation of the university facilities, with the tour centered particularly around the Information Intelligence Engineering Laboratory. 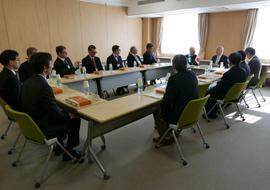 During the tour, the visitors also paid a courtesy visit to University President Onishi, and Vice President Terashima. During the laboratory visit, in addition to listening to presentations from students who were interested in the double degree program and observing the students' living spaces, the UEF members were able to further deepen their understanding of not only the research carried out at TUT, but also gain an insight into student life at our university. On the 19th (Wed), a meeting was held specifically regarding, among other things, the company internships compulsory for students on the double degree program.